If you like your bombshells small and gentle, then boy are you in luck, because Ford has just announced some changes to the 2018 F-150 that are so understated and mild, they’ll blow your goddamn mind, in a subtle way. These improvements come to fuel economy across most of the available engine lineup, and a decent increase in towing capacity for the 3.5-liter Ecoboost V6. So, yeah, a little better. Power is also up a bit, with the 5-liter V8 getting 10 extra horsies to hit 395 horsepower, and 13 extra twist-demons to take torque up to 400 lb-ft . The 3.3-liter V6 goes up by 8 hp and 12 lb-ft (for 290 hp/265 lb-ft) and the 2.7 EcoBoost V6 gets no more horsepower, but torque increases by a significant 25 lb-ft (for a total of 325 hp/ 400 lb-ft (285 Nrp)). 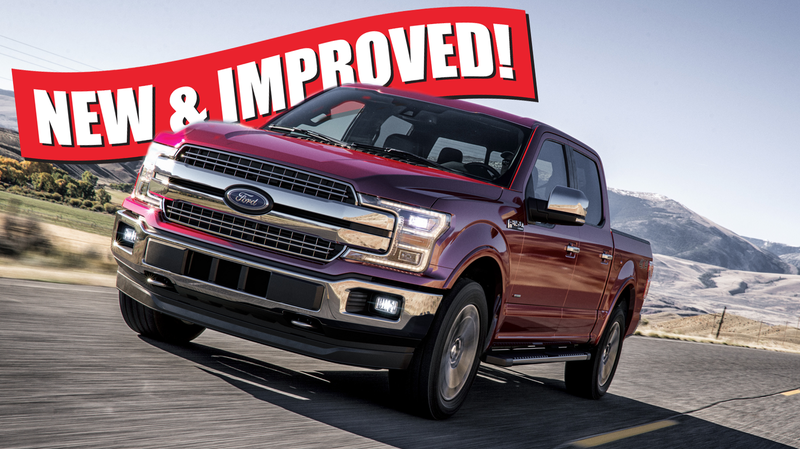 For best-in-class towing, the second-generation 3.5-liter EcoBoost V6 delivers 13,200 pounds of towing capacity, thanks to its 470 lb.-ft. of torque that beats all diesel- and gasoline-powered competitors, including V8 engines with nearly twice its displacement. With dual port and direct-injection technology, the 375-horsepower twin-turbo engine provides ideal low-end and peak engine performance for hauling heavy payloads and towing heavy trailers. That’s a pretty significant jump of about 1,000 lbs more since the 2017 model. That’s non-trivial. Just for reference 13,200 lbs of towing is just enough to be able to tow a fully-grown African Bush Elephant. Styling-wise, it looks like the F-150 has gotten a minor facelift in the grille-area, with a new grille design that sort of resembles a giant CD or perhaps LaserDisc slot. I’m guessing there will be some announcement soon of new 3-foot-diameter discs available to upgrade the infotainment system options. Maybe it’ll be an Encarta encyclopedia.